I know I’ve mentioned more than once my strange fascination with men in drag I’m not referring to men who want to dress as women for their own personal reasons, the Jared Leto/Dallas Buyers Club kind of thing. I mean more power to them and all that, but that’s not amusing. I’m talking about men who are obviously men, dressing and behaving like women for comic effect. In my opinion, Monty Python’s Flying Circus always did this shtick the best. I never fail to laugh at John Cleese wearing a wig and a dress while employing a high screechy voice. The Little Britain guys have their moments as well. But after finally watching all three series of the comedy/horror sketch show, The League of Gentlemen (1999-2002), I have come to the conclusion that the females of Royston Vasey surpass the Python ladies. I think this is because they actually develop many of these “women” bringing them back in multiple episodes and letting their stories evolve, often to ghastly ends. For example, let’s begin with Tubbs Tattysyrup who is brilliantly played by Steve Pemberton. 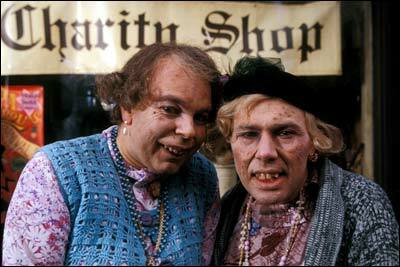 Tubbs and her husband Edward are shopkeepers on the outskirts of Royston Vasey. Murderously xenophobic, the couple strenuously defend their bizarre way of life and the precious things of the shop. Tubbs is unquestionably loyal and obedient to her husband and for that reason has the mind of a slightly deranged child. Pauline Campbell-Jones (also portrayed by Pemberton) is a restart officer for the local government employment services. Your very first impression might be that she is a compassionate public servant, but you will quickly learn that Pauline is in this job for the sense of superiority it affords her. She slags off her clients on a regular basis and if anyone challenges her, she strikes back quite ferociously. Which is why Pauline is in the predicament of being out of a job and having to be a participant in the restart course she used to teach. Reece Shearsmith plays Reverend Bernice Woodall, a bitter,chain smoking clergywoman with a ubiquitous smear of lipstick on her teeth. Her sermons tend to have a bit of a fire and brimstone feel about them as well. We later learn the source of her acrimony and resentment has to do with a childhood trauma that has scarred her, but an even more sinister fate awaits the reverend at Christmas. The tall and willowy Val Denton is portrayed by the equally lanky Mark Gatiss. Mrs. Denton genially but enthusiastically enforces her husband’s strict cleanliness rules. She gleefully recites the color code for household items and thinks nothing of her husband’s obsessive assumptions about self-pleasuring. The family is oblivious to the degree of their freakishness until their nephew Ben arrives in Royston Vaysey for what’s meant to be an overnight stay. Apparently this is the first time their weird ways have been questioned. Homely cleaning lady Iris Krell (Gatiss) is employed by Mrs. Judee Levinson (Shearsmith) a wealthy housewife who has a workaholic husband – or does she? Judee tries to feel good about her empty life by bragging to her working class cleaner about her lavish holidays and expensive clothes. Iris knows that she has a better home life than her employer and isn’t shy about sharing the spicy intimate details of her marriage. A majority of the female population of Royston Vasey belongs to a mysterious sisterhood called Solutions. Stella Hull (Shearsmith) constantly rows with her husband Charlie and wants to stomp on his happiness by preventing him from pursuing his most recent passion, line dancing. Stella appeals to the group to help her find a “solution” to her problem. If you’ve never visited the absurd village of Royston Vasey, you can pay a visit through Hulu or Netflix. Watch with an open mind, get used to the humor and rhythms of this show and you will be richly rewarded with series three – the crowning glory of The League of Gentlemen. Wow, The League of Gentlemen has only just reached you? Great stuff, although series three I found a bit odd as it’s just so different. At least they were trying something new rather than resting on their laurels, but… You haven’t finished yet! I hope this is good news for you that there is some more. First I hope you got the Christmas special between series 2 and 3, however it was digitally packaged for you, which reveals how Mr Chinnery got his amazing veterinary powers, but then there’s the movie! I know most series don’t translate to the big screen, but they were well aware of this, and they succeeded in doing like they did in series 3 with something completely different! Hope you can find it. I see the full title is The League of Gentlemen’s Apocalypse. I actually saw series 1 about three years ago but couldn’t get access to 2 and 3 until recently through Netflix and Hulu. I did see the Christmas special and enjoyed that as well. I have to go on search for the Apocalypse movie now I see. Have you seen the other Pemberton/Shearsmith series? I’m preparing to watch Psychoville soon but can’t find Inside No. 9 yet. Good, I’m glad you saw the Christmas special. I deliberately didn’t ruin it in my comment about who the surprise appearance is at the end. I love that character! I have seen all of Psychoville and Inside Number 9. You can definitely see the other writing partners brought something to the League. I didn’t like Psychoville as it felt there was very little substance to it, when you get to the end of the first series. League was better in being about a lot of different stories. I think the second series brought more to it, but I honestly cannot remember what that was. It is notable in that they did a special episode (with Mark Gatiss as a guest star) that was filmed in one (secretly two) take. It was impressive. It’s out of that, I think, that Number 9 arose. The first episode of Inside number 9 was really bad to start off with. Others had much more about them and they were clever in how they tried to do something with individual episodes. For example there is a modern-day silent comedy. So some good, some bad which included their horror episode. You have to find and watch them all, obviously, so it will be interesting to see what you think. In answer to your question, Pam Doove was the character who said those lines. I love that sketch, its one of my favourites.